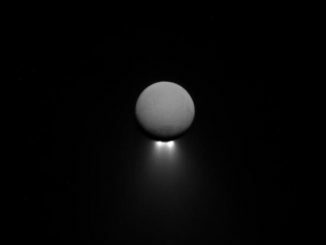 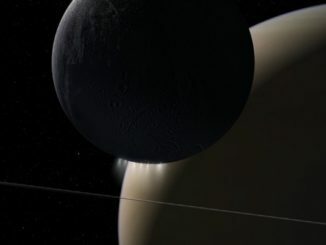 Data recorded by NASA’s Cassini spacecraft shortly before it was directed to crash into Saturn at the end of its historic mission reveal powerful plasma waves moving from Saturn to its icy moon Enceladus. 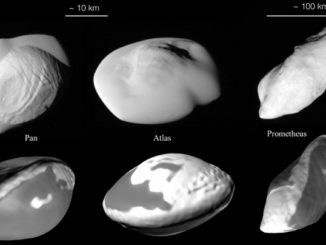 Computer simulations show how some of Saturn’s small inner moons might have acquired their unique pasta-like shapes thanks to low-velocity near head-on impacts of smaller bodies in the presence of extremely strong tidal forces. 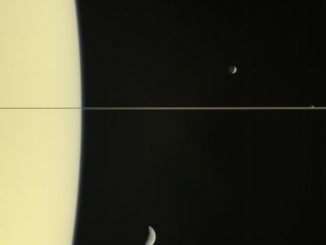 A postcard from Cassini – a stunning edge-on view of Saturn, its rings, their shadow and three moons, captured by the orbiter in 2006 as it passed within about 2.7 million kilometres (1.7 million miles) of the sixth planet. 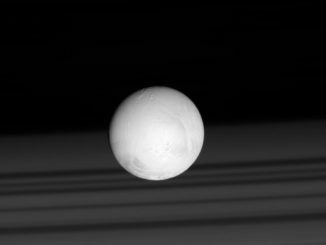 Saturn’s rings cast shadows on the planet’s cloud tops, providing a perfect backdrop for the brilliant sphere of the moon Enceladus in this image taken by NASA’s Cassini probe. 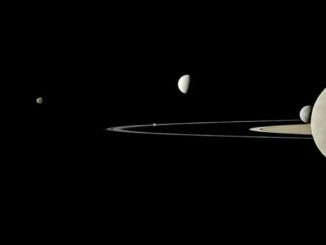 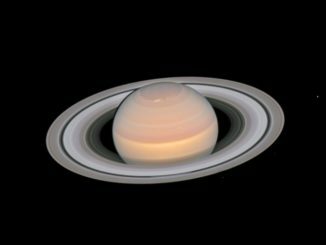 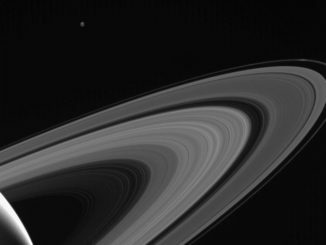 NASA’s Cassini probe gazes across the icy rings of Saturn toward the icy moon Tethys, whose night side is illuminated by Saturnshine, or sunlight reflected by the planet. 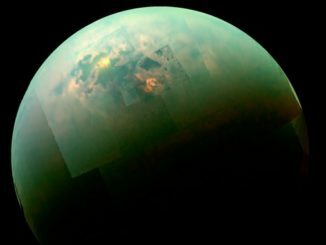 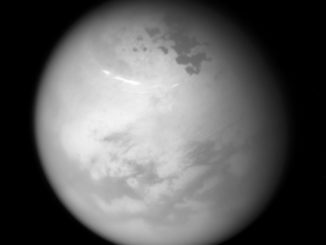 NASA’s Cassini spacecraft captured this view of bright methane clouds drifting in the summer skies of Saturn’s moon Titan, along with dark hydrocarbon lakes and seas clustered around the north pole.